I am re-reading ‘Open Veins of Latin America’ by the Uruguayan author Eduardo Galeano – 500 years of marauding throughout Latin America by Europe and, later, the United States of America. Galeano writes with eloquence, weaving historical fact with quotes from the oppressed and oppressors, images of despair with those of arrogant greed. An exploration of exploitation. Part 1: ‘Mankind’s Poverty as a Consequence of the Wealth of the Land’ and his description of Potosi resonated especially with me. In the 16th century Potosi in Bolivia became the world’s largest industrial complex. The Spanish pillaged it’s Cerro Rico mountain for silver, discarding the worthless tin in rubbish piles, and lined the pockets of the imperial bourgeoisie. The local Indian population were turned into slaves, with 8 million Incas thought to have died during the years of Spanish silver extraction. And then the silver ran out. Today the tin that was dumped in heaps or left within the tunnels of Cerro Rico provides a pittance for the population of Potosi, the Spanish leaving the people and their ‘rich hill’ in poverty. A few years ago I visited Potosi with its ornate colonial architecture and grand churches built before the Spanish left in 1825. In the 1980s the Bolivian Government abandoned the no longer profitable mines and they were opened up to anyone willing to work. Today small family-run cooperatives scour the mine for whatever is left – pounding, dynamiting the rock in tunnels, amidst an air low in oxygen and filled with dust. Silicosis and other pulmonary illnesses mean that few live beyond 40. 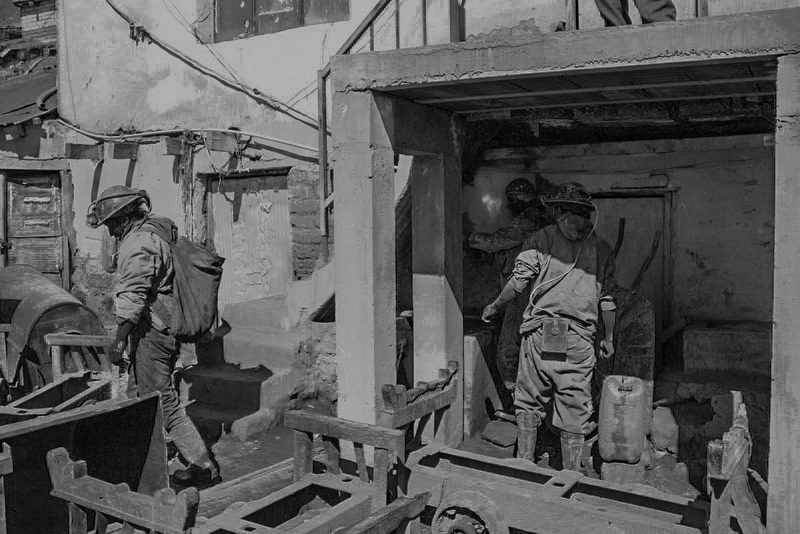 Cooperatives provide health insurance and control the funds brought in by tourists visiting the mines, a bonus to the small profit made by miners after purchasing tools, dynamite, acetylene lamps and coca leaves to suppress hunger and pain during the long shifts underground. Days are made bearable by the consumption of strong alcohol, cheap and potent, and the worship of Tio, the God of the underworld, who holds the power of life and death in these volatile, claustrophobic conditions. One would think in 500 years our acceptance of exploitation of the poor by the superpowers for ever increasing wealth would have waned. But what of our lust for diamonds at the expense of child soldiers, horrific amputations and devastation in Liberia and Sierra Leone, or our desire for coltan to build mobile phones and computer chips funding the brutal militias of Congo, or the World Cup stadiums in Qatar built on the corpses of Nepalese and Indian migrant workers? And when the resources are gone or the event over what are these people left with? When Galeano visited Potosi in the 1960s he spoke to an ‘unemployed man who was scratching through the dirt with his hands’ who said: ‘The Cerro is still rich….There must be a God, you know: the metal grows just like a plant.’ How many more are left with deluded hope at the hands of western greed? A desert drunk on peyote and a drink of pulque to sing with the coyotes. Everything I need.